The “Lomond” is the Eternity Celtic knot. 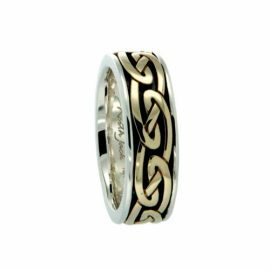 The traditional open weave Celtic knot encircles the ring. The “Lomond” is perfect if you are looking for a standalone Celtic knot. 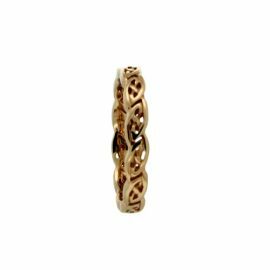 This beautifully crafted Celtic inspired gold ring is available in 10kt or 14kt gold. You choose white gold, yellow gold or rose gold to create your own special piece of jewelry. Delivery times are dependent on availability of items and the method of shipping requested. This item is specially made for you and will ship in approximately 6 weeks. Upon shipping, delivery time to your specific location is per Canada Post guidelines based on the Shipping method you requested. You will be notified by email when your item is shipped or when it is available for pickup (Local). If you require your product sooner, please place a comment in the Order Notes box during checkout or contact us directly at 403-286-1932. We will do our best to accommodate your request. The “Earn” is a representation of the Dara knot which encircles the entire ring. The combination sterling silver and 10kt gold “Earn” design has an oxidized background in centre. The “Ness” is your Window to the Soul. 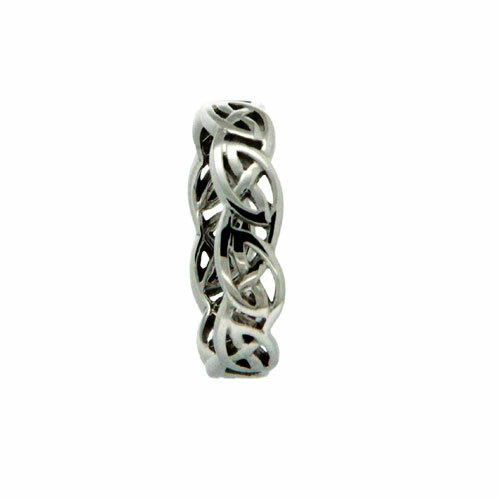 The traditional Celtic knot encircles the ring signifying your love. 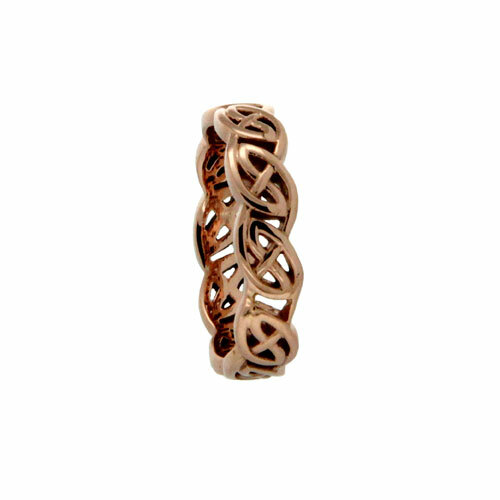 This beautifully crafted Celtic inspired gold ring is available in 10kt or 14kt gold. You choose the combination of white gold, yellow gold or rose gold to create your own special piece of jewelry. The “Gowan” is an extra wide Eternity Celtic knot. 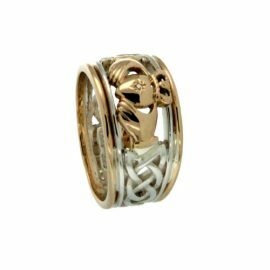 The traditional open weave Celtic knot encircles the ring. The “Gowan” is perfect if you are looking for a standalone Celtic knot but in a wider width. 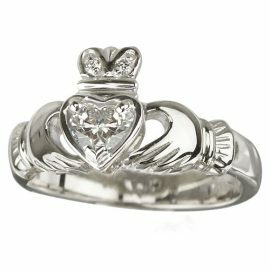 This Claddagh band is flanked by rails of your choice with a diamond inset. This particular design has the appearance of double rails. Wide on the top, it is a tapered fit. As an extra, you also choose the metal of your choice for the Claddagh. 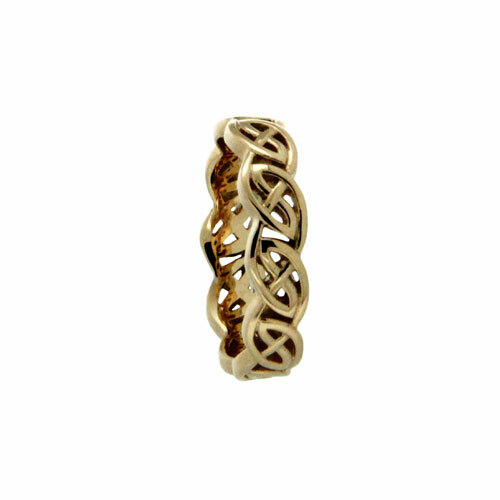 This beautifully crafted Celtic inspired gold ring is available in 10kt or 14kt gold. Create your own special piece of jewelry. 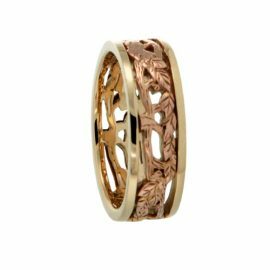 The “Awe” is a stylized Tree of Life design that circles the entire ring. The “Shin” is the Eternity Celtic knot. 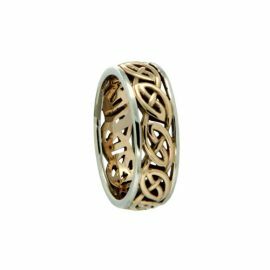 The traditional Celtic knot encircles the ring. 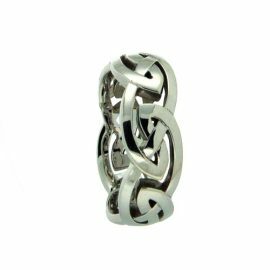 The “Shin” is perfect if you are looking for a standalone Celtic knot. This design is a tighter weave and is narrow width ring for those who are looking for something a bit more delicate. All Solvar Irish themed jewelry is individually designed, drawing inspiration from Ireland’s rich past and unique icons such as the Claddagh. This Claddagh Diamond ring in 18kt white gold has a 0.25ct solitare diamond inset into the centre heart and diamond accents in the crown. This extra special Claddagh is a perfect engagement ring. A matching band specifically made to fit this ring is also available. The “Laro” is a Raised Eternity Celtic Knot. 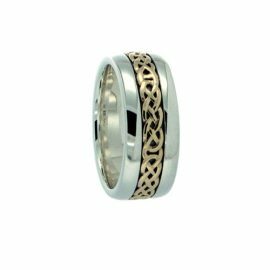 The combination sterling silver and 10kt gold “Laro” design has an oxidized background in centre.